Baby You’re Still the Best! It has been a whirlwind romance that I don’t see ever abating. I simply love the automobile in all its glorious forms but naturally, there are lasting exceptions. 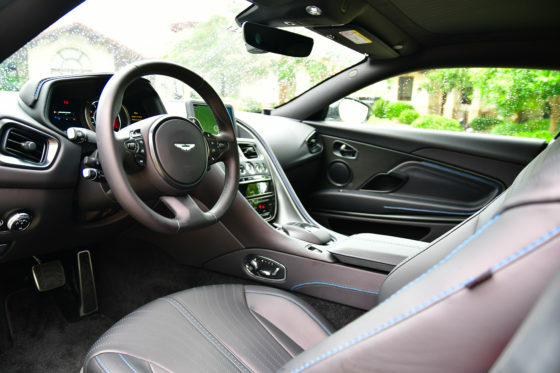 When I first drove the 5.2-liter V12 Aston Martin DB11 in Japan, I played the virtual song of Nancy Sinatra’s alluring theme of the same James Bond movie title, “You Only Live Twice” in my head while I basked in the aural sensation of a dozen twin force-fed cylinders. Then I comprehensively tested the all-new Aston Martin Vantage in Portugal that featured the ferocious new twin-turbo 4.0-liter V8. 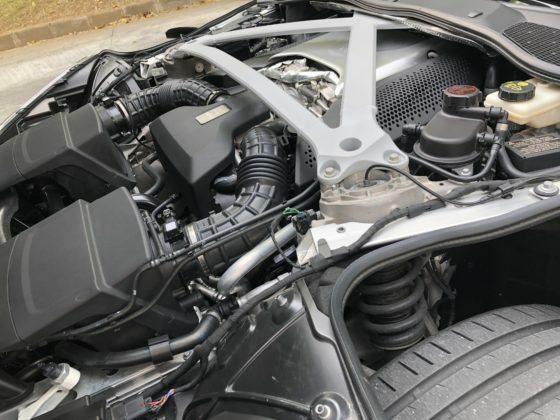 In between these two monumental tests, my business partner and C!’s Editor-in-Chief Carl S. Cunanan reviewed the same AMG V8 engine that was tuned differently for the DB11 in Spain. 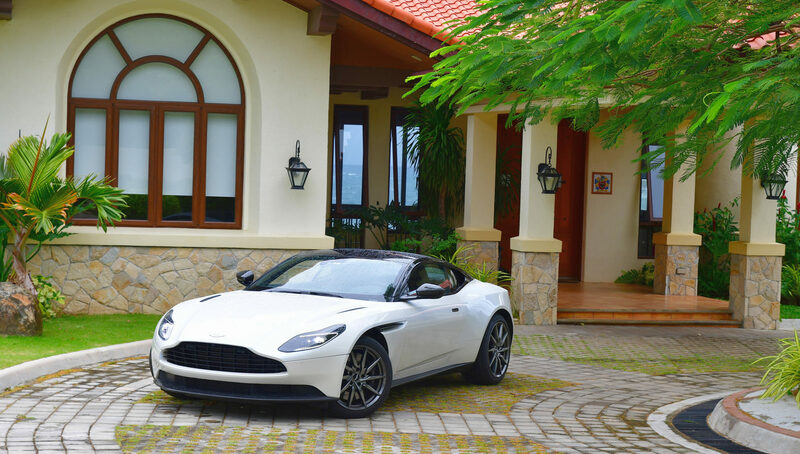 So, it only made sense that I unify all the experiences with a Philippine territory test of the locally packaged Aston Martin DB11 V8. 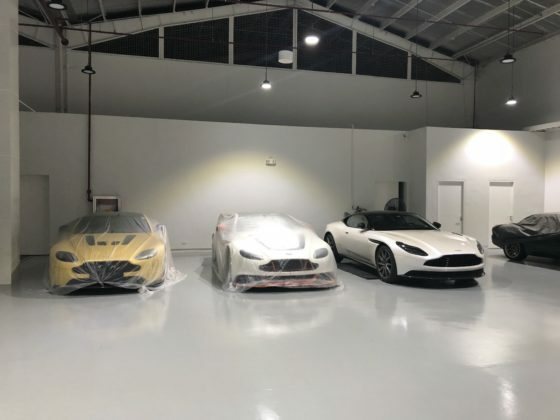 Keep in mind that the official Philippine distributor actually sells all four current models of the DB11: the V8, V12, the Volante convertible, and the 630 bhp AMR (0-100 km/h in 3.7 seconds, 334 km/h top speed). 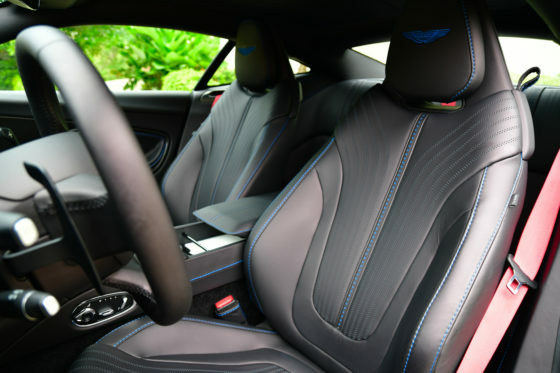 The closely related 715 bhp / 664 lb.-ft V12 DBS Superleggera,which has a top speed of 338 km/h and accelerates from 0-100 km/h in 3.4 seconds, is also coming in to the country very soon. All of them are supreme high-performance beasts with very little dynamism separating each of them in real world driving. The choices that dictate acquisition are more behavioral and packaging. There is no wrong choice, but it is an intimate individual decision. Running the Aston Martin DB11 V8 on our roads is an essential exercise. Before I get into the performance nuances between the two powerplants do consider our actual driving surfaces and road conditions. On our test conditions in Europe, Japan, and North America, the roads range from mostly very good to immaculate. That is not even taking into consideration weather/environment, traffic conditions/density, wildlife, and pedestrians. Our gorgeous Morning Frost White (AML Special) with primarily black interior highlighted with Spectral Blue leather stitching, tasteful contrasting red seatbelts with piano black roof test unit was run on Bridgestone’s new Potenza S007-A tires instead of the standard bespoke S007;the difference is that the standard tires are slightly more tenacious and carry a little rear tire load. The S007-A tires are a bit more forgiving which helped absorb the punishing surfaces of our local roads. 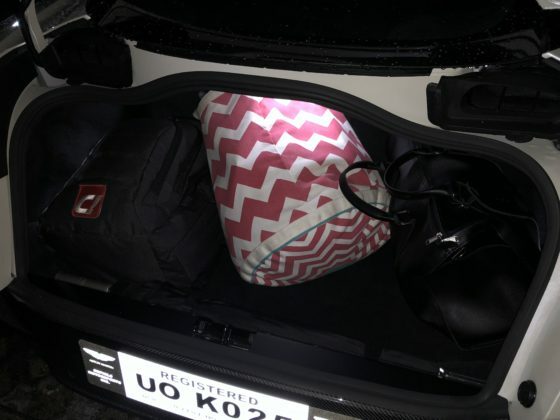 I picked up the DB11 at Aston Martin’s lovely new service facility on Pasong Tamo Extension outside of the Dasmariñas village late in the afternoon, loaded it up with luggage at my home, gassed up, then drove off to the beach. Hey folks, don’t get me wrong, despite all the cars and motorcycles that I test every year professionally for almost two decades, I still felt elated to be behind the steering wheel of such an epic GT coupé. I felt like a real superstar yet I never forgot that I signed off on the experience taking full responsibility for the DB11 in case any unfortunate situation was to occur, so as always, I drove the car methodically and with great care. The distance one way was less than 120 kilometers through the usual routes from Makati to Nasugbu, Batangas. As expected, the traffic was fairly heavy from the highway leading up to Tagaytay from the Santa Rosa exit with barely any opportunity to stretch the DB11’s legs. The stares of awe and wonder were on every face that spotted the car, no surprise there. Even the Petron fuel station attendant off the SLEX got excited to see the Aston Martin, and got a whole bunch of his fellow team members to come and look at the car. What was interesting was while I stood next to the rear of the car as it was being fueled, the Petron attendants all candidly shared their own opinions sighting that they all hadseen and serviced multiple supercars and hypercars through the years but they all agreed that the DB11 was the most impressive to behold! Perhaps they were all trying to please me, so I quickly shared with them that I was not the owner and was testing the car for C! Magazine. Guess what, they all still held their ground and insisted that they all loved the DB11 sighting that it was so elegant and classy without being in your face like other such cars! 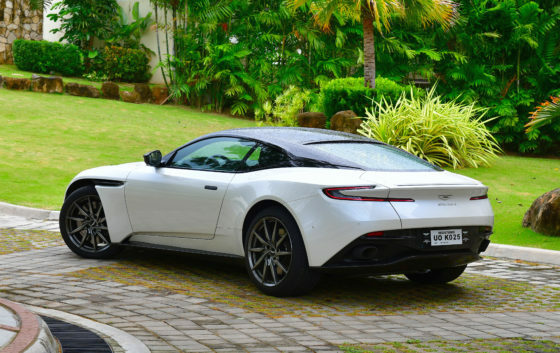 Once again on the way, and taking into consideration that our Philippine roads are less than ideal, the DB11 rode with taut grace. Aided by the touch better absorption from the S007-A tires, the almost magical ride of compliance of the DB11 had no problems. 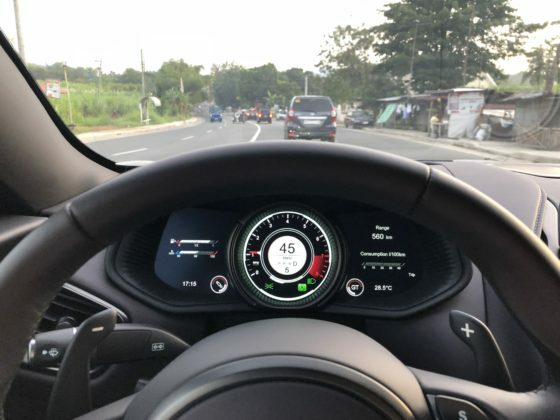 At mostly plebian speeds heading up to Tagaytay,I got to enjoy the sensational 1,000-watt Bang & Olufsen BeoSound Audio System with ICEpower technology. The pure mechanical cacophony of the potent and lusty V8 was always obviously at bay waiting to be released. The car’s deep abilities remained omnipresent but relaxed. 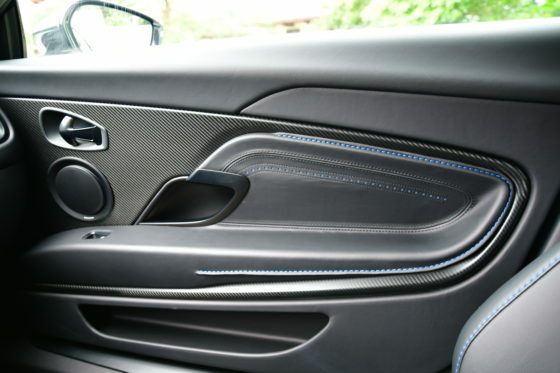 I recognize the DB11 as a culmination of organic high technology with personality. 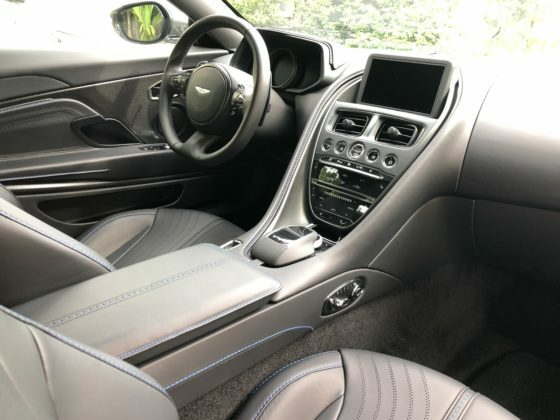 The Aston Martin DB11 is a large and very sensual coupé that can be enjoyed on the road as well as on the track, though it is truly best enjoyed on fast, long distance transcontinental journeys where you can explore all the very deep abilities in total immersive comfort. Thankfully, you can adjust the three-stage active suspension independently from the throttle/transmission settings on the steering wheel so you can really tailor the car to your unique needs. Theubiquitous 8-speed ZF gearbox is once again on assignment for good measure, and dependably it works here with smoothness and quick shifting when you need it to be especially when you use the slightly closer paddles compared to the V12’s system. The V8 also has auto ignition start/stop to help save fuel at stoplights or stop-in-go traffic. The DB11 V8 is about 253 pounds (115 kg.) lighter than the V12 with the equivalent equipment and it feels like it without giving up much power either. In fact, for the Philippines, I would recommend the more lithe V8 model because it has almost exactly the same torque power band as the V12. Given that the vast majority of the time on our roads will be traveled at legal speeds, I would rather give up the extra top-end power that we frustratingly can’t really use regularly in our country for better handling and nimbleness as well as better fuel economy so you actually spend more time enjoying the car on the road. At speeds less than 250 km/h,you will not benefit greatly with the V12 and you actually save the equivalent cost of three very nice cars in the process without losing any luxury nor any real sense of performance and pride of ownership. The journey to and from the beach ended up being about 250 enjoyable and at times very thrilling kilometers. With an indicated fuel range of close to 600 kilometers from the start, I actually returned the DB11 with more fuel than when I picked it up with at just over half tank which proves that such a great high-performance GT can be exhilarating yet quite economical under real-world driving conditions. I’ve said it before that the DB11 is a cornucopia of superlatives;the car generates a sensory extravaganza that lingers with you. In all, the all-new DB11 is everything that Aston Martin worked so hard to craft, design, and engineer to be. It may not have the opulence and space of a Rolls-Royce Wraith but then again, the DB11 is a lot easier to attain and drive euphorically every day accompanied with a glorious mechanical orchestra. It is the most complete premium grand touring coupé that has all the essential ingredients to make it rewarding without ever thinking about James Bond. Instead, you create your own narrative and adventures in a painfully beautiful car that will confidently perform whether you’re ripping through the air at 300 km/h or moderately cruising through a scenic country road.